I made this a while back with the idea that VSF hunters would use these ambulators to hunt dinosaurs. I think they'd look better with bat wings on the sides so they become a sort of mechanical ostrich. Then people could use them to stage jousting tournaments. Where are those images from? I really like the color palette on the first one, kind of reminds me of Tatooine. 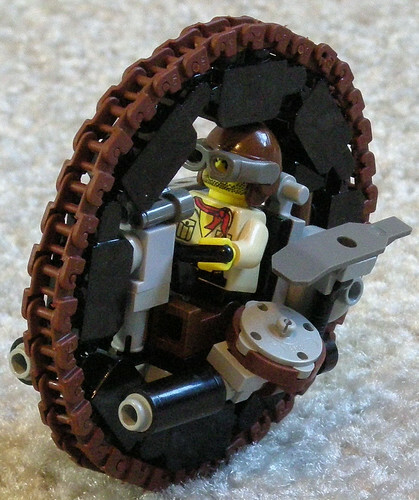 Once upon a time MelEbbles talked about making one of those big wheel vehicles like the Lego machine, too bad that didn't pan out. The hunting platform was initially designed for sporting enthusiasts who liked the challenge of going after the resurrected creations of the Martian invaders. The legs allowed them to traverse treacherous swamps and keep pace with the huge reptiles while maintaining a steady firing platform. Hmm, I should finish this piece. Added some wings, a headlamp, and a mini boiler. Should all fit on one page. Would it be possible to have the cabin walls slope upwards towards the back? Your comment about jousting got my imagination going a little, and if the walls sloped upward, the wings could either be positioned outward for hunting, or furled for jousting. Okay, now I see how to do these. the little steering outriggers make it much more practical. 280mpg? Why aren't the roads full of them? 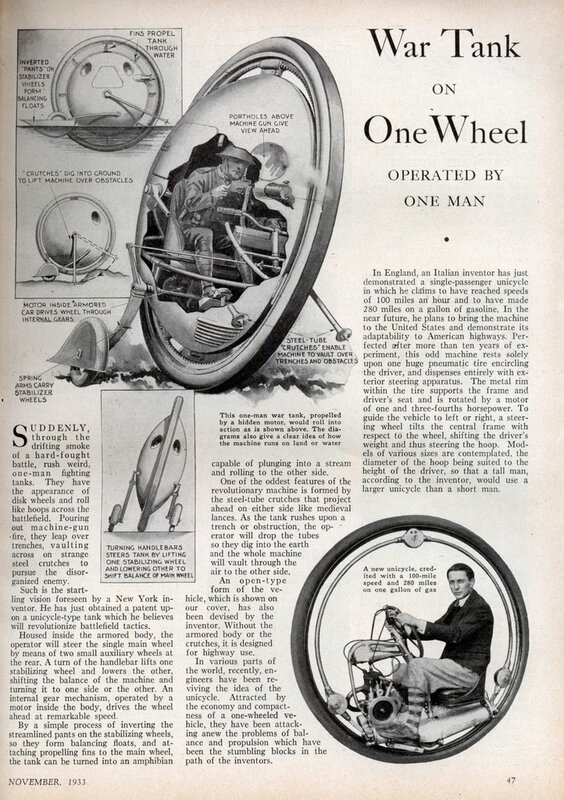 Seems like there should be a human powered variant. Having some of the thoughts down on paper before I approach a computer helps me immeasurably. I have questions, but trying to frame them is difficult. I assume the engine box connects to the first round do-hickey out from the drive wheel. the facet that is opposite the gun, correct? and then on the other side, too, right? An interesting engineering/design problem you have posed yourself, but I'm sure it will work out. It will probably make more sense to me when textures are added. Looking good, I like the chunky thickness. Thought that would be more interesting than the real-world solution of putting the engine inside the wheel. The wheel has an optional guard that pops on top, not glued here so the armor flap is blocking the view-plate. So, needs a different gun, too angular for all of the other curvy shapes. The outriggers will be broken into two parts for pose-ability options. Probably the oddest thing I've designed, not sure what to call it. edit-> Brightened up the pics. Throwing the guard on there really makes a number of ideas pop into my head for other versions of this. I kinda like that Uni-Tank name. About that"Chicken-thing" at the top, I think it would have a better aesthetic feel if the legs were reversed, and more cantered, and less humanoid. I think you may be right on that, Dave. But I would imagine that you would be able to swap the legs left to right and be able to kitbash it. The uni-ball-steam-tank struts are now in two parts so they can be posed better. The wrong-trousers legs can go either way, they've been textured and are waiting for this weekends test-building. My main concern is that the legs be strong and balanced enough to hold a metal mini up, I think they will, but I need to check for certain. "Wrong Trousers!" LOVE that! Now I have to put a penguin in there! If you are concerned about the strength of the legs, do what I did on my K'Vyk War Walker. You can put a "second leg" on the existing one (since it is a fold-over, you actually get the strength of FOUR sheets of cardstock), and you can make the feet "Y-shaped" by not gluing the "Toes" together. (The picture is a little dark, but the idea is sound). That makes the legs VERY sturdy, and a metal figure *should* work well in there. If there is an issue, it won't be because of the legs. (I know... somewhere along the way I actually stopped being a joke, and learned some helpful things). I've always held to the 'if in doubt, throw another layer of card in between' school of thought. I doubt there will be an issue with strength, but somebody out there will print this on the thinnest possible copy paper possible and complain about the legs not being strong enough. Better safe than sorry. 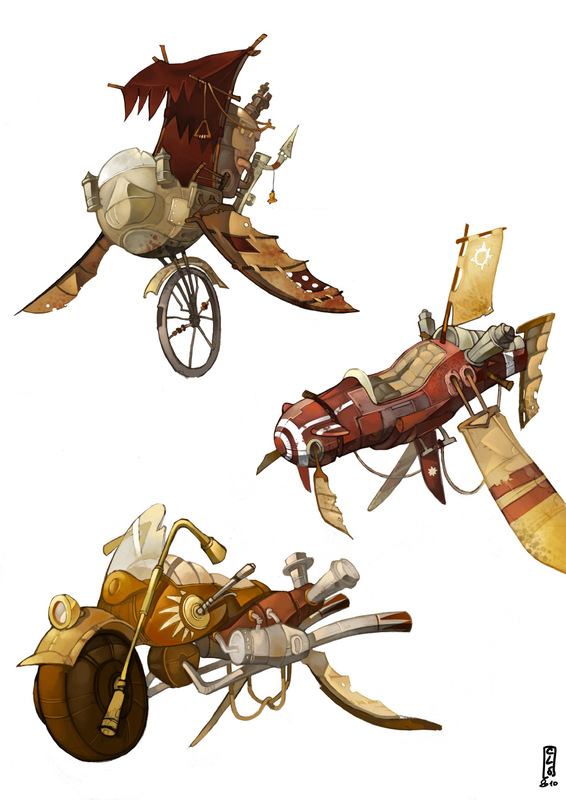 Eventually they'll need a name along the lines of "Professor _______'s Steam-Powered Sarabara", or something like that. I like the three-toed multi-ply idea, I'll have to do some rearranging on the page and give it a shot. The tank will probably be called the "Monotread Steam Ball". Hero (or Heron) was a first-century CE Alexandrian engineer. This was a steam engine he invented. "Aeolipile" comes from the Greek word aella, which means "whirling motion" as of a whirlwind or whirlpool, and, according to who you listen to, pila, a Latin word for a playing ball. 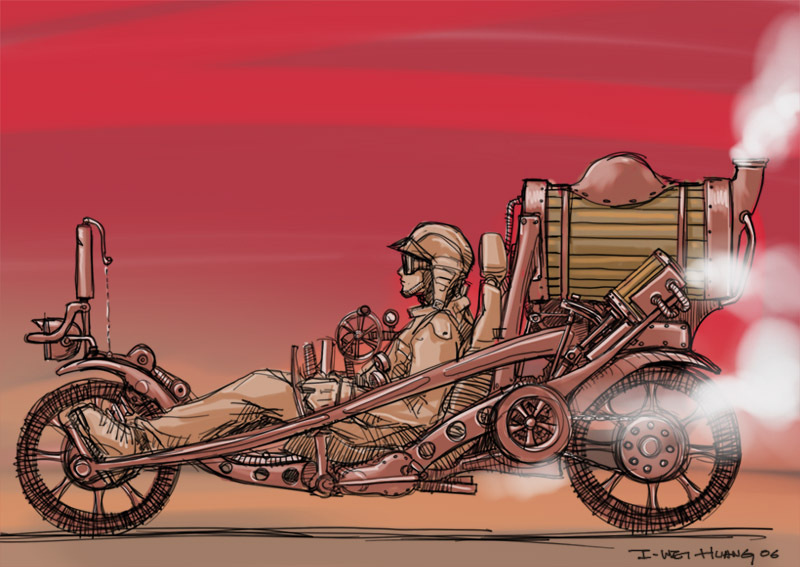 "Prof. Squirmydad's Patented Steam Aeolipanoplia" would roughly translate into Prof. Squirmydad's steam-powered whirling-armor. That one is a strong contender for the actual title, needs a different professor name though. I'll let YOU pick the Professor's name!